Fried Green Tomatoes: A Taste of Old New Orleans Proust sure had it right, writes Gail Chalew. Tasting a familiar food can trigger instant memories of simpler, happier times. For this returned New Orleans evacuee, green tomatoes, that piquant and uniquely Southern delicacy, are the food inextricably linked to the Big Easy. 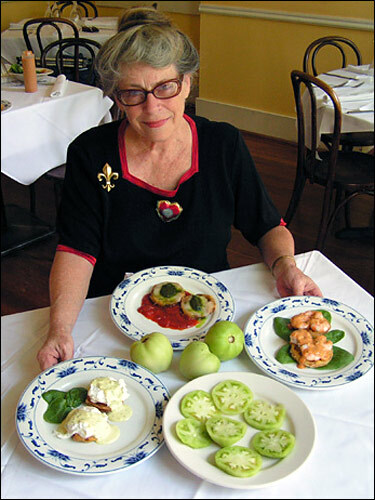 JoAnne Clevenger, owner of New Orleans' Upperline, loves the versatility of green tomatoes and uses the fried version in an array of dishes, including with shrimp remoulade, with mozzarella and tomato sauce, and in a Southern version of eggs Benedict. Scroll down for the recipes. Gail Naron Chalew is a freelance writer and editor rebuilding her life in New Orleans. A native of Baltimore, she has grown to cherish New Orleans' food, music and laid-back ambience. After returning to New Orleans from nine months of post-Katrina exile in Baltimore, I bit into some fried green tomatoes, and life in this post-apocalyptic city seemed a bit sweeter, a bit less topsy-turvy, and a bit more carefree. Proust sure had it right: Tasting a familiar food can trigger instant memories of simpler, happier times. There is a simple reason why fried green tomatoes are such a particularly Southern delicacy: supply. Green tomatoes are just regular tomatoes picked before they turn red, and have a more piquant flavor than their ripe brethren. Tomatoes grow in such abundance in the South's lush growing season that green, unripe ones need to be picked throughout the summer to prevent the branches from collapsing under their weight. In contrast, unripe tomatoes are picked in the North only at the very end of the season, when it is clear that they will not ripen before the first frost. 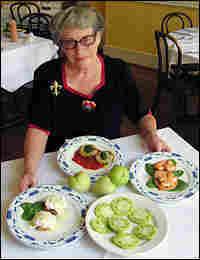 Among the culinary set, many consider JoAnn Clevenger, owner of the contemporary Creole Upperline Restaurant in New Orleans, to be the Green Tomato Queen. It's a title she wears proudly. Growing up on a small tenant farm in central Louisiana, Clevenger learned to savor down-home cooking. Tomatoes, whether ripe or unripe, were a staple. Her family always ate fried green tomatoes with pork, the acidity of the tomatoes being a perfect foil to the fat-laden meat. A few years after she opened her restaurant, and inspired by the 1991 movie of the same name, Clevenger added fried green tomatoes to Upperline's menu. She wanted to give fried green tomatoes the perfect contemporary Creole accent. After much thought, she married the tomatoes and shrimp remoulade -- the classic, spicy New Orleans sauce, swimming with shrimp. Her creation -- this pairing of hot (tomatoes) and cold (remoulade), of traditional Southern cooking and exotic New Orleans spiciness -- now is found in restaurants across the country. Because of fried green tomatoes' versatility, Clevenger and her chef Ken Smith continue to create new ways to serve them. 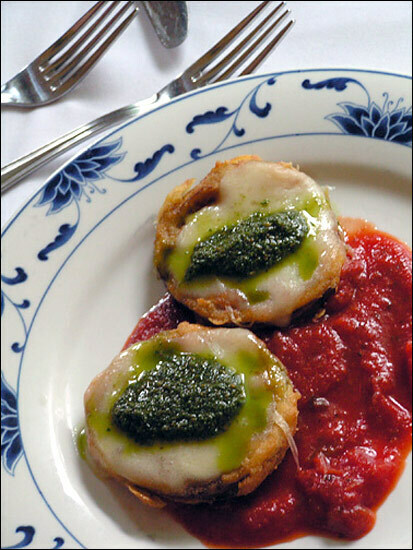 So far, they've come up with using fried green tomatoes in place of fried eggplant in a variation of eggplant parmesan, instead of an English muffin in a nouveau eggs Benedict, and drizzled with red tomato salsa as an all-tomato appetizer. Clevenger has revamped another New Orleans classic by making fried green tomato po'boys (the city's version of sub sandwiches). She slices French bread in half, scoops out the bread to make room for the fried green tomatoes, and adds dollops of shrimp remoulade on top. Then she reassembles the po'boy, cuts it into two-inch sections and skewers each with a toothpick. Like many great cooks whose food-preparation knowledge is instinctive, Clevenger is a bit inexact on how to choose and prepare green tomatoes for frying. Here is her advice: They should neither be too hard, like an apple, nor too soft, like a ripe tomato. They should be green all the way through, though a tinge of pink on the inside is OK. They should stand up well either to deep frying or pan sauteing. Slices should be neither too thick nor too thin; half-inch slices are good for most uses. Whether you are a storm-tossed Gulf Coast resident or just someone who savors home cooking spiced with contemporary sass, any one of these permutations of fried green tomatoes should cure whatever ails you. The following recipes are from the Upperline Restaurant in New Orleans. There, the tomatoes are dipped in buttermilk before dredging them in seasoned corn flour (finely ground corn meal), although recipes vary tremendously; some cooks dip them in eggs and use plain corn meal or wheat flour. Heat oil in a large saute pan over moderate heat. Meanwhile, dip tomato slices in egg mixture, then coat with corn flour. Place tomato slices in pan in a single layer. Do not crowd. Cook over moderate heat until golden brown on bottom. Turn and brown on other side. (Total cooking time is 3 to 4 minutes.) Tomato should be cooked all the way through but not mushy. Exterior should be golden brown. On individual serving plates, place 2 slices of tomato next to each other and top each slice with 3 chilled shrimp. 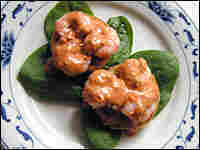 Spoon 1 1/2 tablespoons remoulade sauce over the shrimp on each slice and garnish plate with a few mixed greens. The tomatoes are served warm or hot. The shrimp and remoulade sauce should be cold. 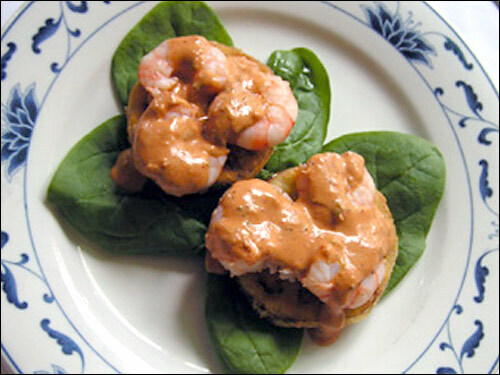 Variations: Eliminate the shrimp and put the remoulade sauce directly on the tomato slice. Crawfish, scallops or lobster may be substituted for the shrimp. Combine ingredients in Group A except salt and mix well. Add salt to taste. Add olive oil in slow stream while whisking mixture. Add rest of Group B and mix well. Add a few drops of hot sauce if a spicier flavor is desired. Sauce should be spicy and tangy. Cover and chill before use. Covered and refrigerated, the sauce should keep about 3 weeks. Place prepared fried green tomatoes in a single layer on sheet pan; top each one with a cheese slice. Put in oven until cheese melts. Put 1/4 cup marinara sauce on each serving plate and top with 2 tomato slices per plate, side by side. Garnish each slice with 1 tablespoon pesto. *Ready-made marinara sauce and pesto can be purchased at many grocery stores. The classic recipe for eggs Benedict calls for toasted English muffins topped with Canadian bacon, poached eggs and Hollandaise sauce. Here are three variations on a theme. Substitute fried green tomato slices for the English muffins and top eggs with bearnaise sauce (a classic French sauce of vinegar, wine, tarragon, eggs and butter) spiked with your favorite hot sauce (Clevenger recommends Tabasco or Crystal Hot Sauce). Substitute fried green tomato slices for the Canadian bacon and top with bearnaise sauce spiked with hot sauce. Go all the way and add a slice of fried green tomato between the muffin and the Canadian bacon, top with egg and the spiked bearnaise or a little pepper vinegar*. *JoAnn Clevenger says that pepper vinegar was always on the table at her Grandmother Brister's house in Alexandria, La. In the late 19th and early 20th centuries, most families in central Louisiana had a bird's eye pepper bush near their back steps and made their own pepper vinegar.